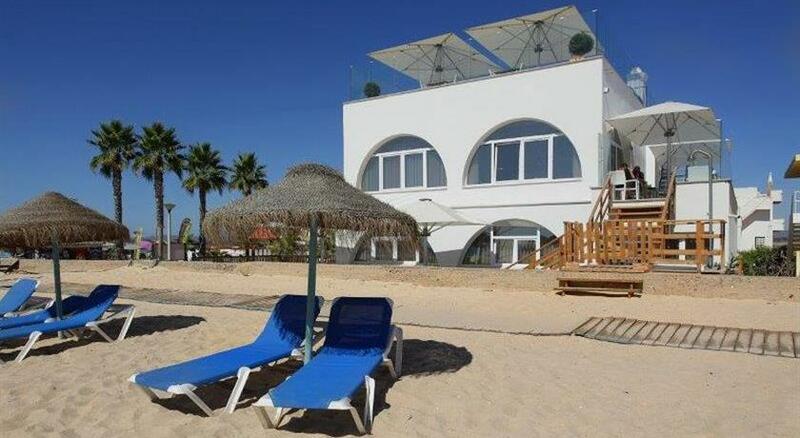 Welcome to the latest and most modern accommodation on the beautiful beach of Faro, created with the aim of transmitting the comfort and traditional Portuguese and Algarve hospitality. At the entrance of Faro Beach, with direct access to its golden sands and a few meters from the sea, you can enjoy during your stay a breathtaking view over the sea and the Ria Formosa Natural Park. As a way to provide the greatest possible comfort, access to the facilities is totally exclusive to our guests. You can relax in our Bar, where we have a varied menu, with cocktails and natural juices, or in one of our 3 outdoor areas: front terrace, side terrace and roof top terrace, where we have a jacuzzi, a modern and elegant bar, and meat or fish barbecue every evening for dinner. Throughout the day, our guests can also enjoy the delicacies that we have at your disposal. All rooms are equipped with a flat-screen satellite TV, a safe and most have sea views. The bathroom includes a shower, bathrobes and slippers. We also have various activities at our guests disposal, such as boat trips, where you can discover the charms of the Algarve coast, horse riding, windsurfing, skysurfing, cycling, access to theme parks or spa and beauty treatments. The accommodation also provides bicycle and car rental. We will do everything to provide our guests an unforgettable stay at Luxury Beach Guest House. The glorious golden sands of Faro Beach extend along the coast of Faro Island, while on the other side of the island you can see the lagoons and mudflats of the Ria Formosa Natural Park. It is hard to believe how such a stunning and relaxing location is so close to the city (at a distance from a road bridge) and is practically unknown by most tourists. At Luxury Beach Guest House you will experience all this natural beauty. On the island you can also find gift shops, ATM and a variety of bars and restaurants serving traditional fish and seafood specialties. Guest House is 2.5 km from Faro's Motorcycle Concentration Camp in July, and 3 km from Faro International Airport. Discover the pristine Deserta Island (Barreta Island) only 3.9 km from the Luxury Beach Guest House.